Houses & Homes VA: It’s surprising what some people don’t know about their own home! It’s surprising what some people don’t know about their own home! There are 3 things in your home that you need to know in the event of an emergency. They are the main switch for the electricity entering your home, the valve to turn off your water (there is more than one) and the main shutoff for the natural gas that you use for your stove and other appliances (such as a dryer). All newer homes have a main switch that can be used to stop the flow of electricity for the entire home. This can be vitally important in the event of an emergency, especially a flood. Most people are familiar with the subpanel which is normally referred to as the “breaker box” but not everyone realizes that there is usually a main switch located before the electricity actually reaches the breaker box. In newer homes the main switch is located in the electric meter or just inside the home close to the meter outside. In older homes there is the possibility that there is no main shut off for the power. If this is the case in your home than you might consider upgrading your electrical system, especially if it still uses the old glass fuses instead of the newer (and safer) “breaker” switch found in most homes today. All homes that have gas “piped in” from the local utility company are required to have an emergency shut off valve. 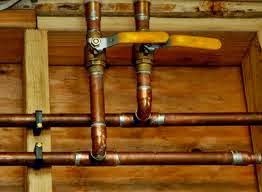 In addition most municipalities also require a separate shut off valve for each appliance that the gas is connected to (such as a water heater or dryer). In most homes the gas meter is located outside of the home and this is usually where you will be able to turn off the gas supply to your home in an emergency. The switch is normally located just below the meter. BE AWARE THAT A PIPE WRENCH IS NORMALLY REQUIRED TO TURN OFF THE GAS. I suggest keeping one handy and as close to the shutoff valve as possible. Looking for a wrench after an earthquake or when you smell gas in your home is no time to search for a tool. There are some states that have an automatic shutoff installed that will stop gas from flowing to the home in the event of an earthquake. California is a good example of this and if there is an earthquake only the utility company is able to turn the gas back on. Usually every sink or toilet in the home has a separate shutoff valve in case of a problem. This is so you can turn the water off at a leaky sink or toilet but still have water in the rest of your home. It is interesting to note that most tubs and showers do not have a separate shut off valve and the only way to stop the water from flowing to them is to turn off the main valve for the entire house. The location of this valve is usually located outside of the home somewhere near where the water pipes enter the home but it is possible that it is located elsewhere. That’s why it is so important to know where it is located before you experience some type of emergency. Water coming into most homes is under considerable pressure and a lot of water can enter your home very quickly in the event of a burst water pipe or other situation. You need to be able to turn off the water as quickly as possible to prevent water damage to your home.